Gold Gym started in Venice California in 1965; rapidly became the center for the development of training techniques and nutritional concepts that formed the foundation for the modern fitness revolution. Today Gold’s Gym has over 700 facilities across the globe among which 65 are located in India. Its first Indian branch was set up at Nepean Sea Road, Mumbai in 2002. Currently, at each location in India, they have more than 2000 members enrolled to utilize their services like Personal Training, Spinning Studio, Massages, Stream Room and many more. Gold’s Gym facilities are equipped with expensive gym equipment’s hence controlling access to it was of prime importance for them. They wanted to provide access only to its members for utilizing the gym’s facility by using a biometric access control system. A fingerprint-based access control system was required which can enroll the fingerprint image of all the members. At every location, Gold’s Gym has a membership base of approximately 2000 members which they expect to escalate quickly. The basic requirement of the company was to allow access only to valid members on the bases of their fingerprint image. Another requirement was that access to the premises should be granted only for the duration of the membership. 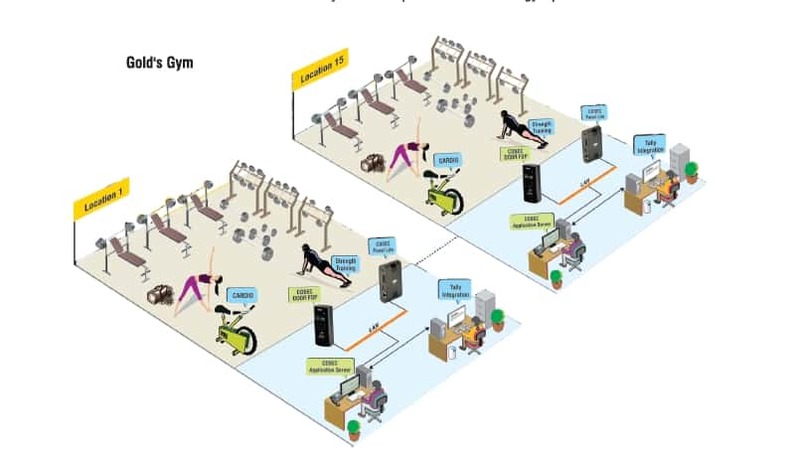 Further, integrating the existing Tally software (wherein they store all their membership details) with access control software was also mandatory for Gold’s Gym. Matrix comprehensive solution offered to Gold’s Gym provided access to members using their fingerprint image. At every facility of Gold’s Gym, fingerprint-based biometric door controllers are installed to monitor access. This allows entry only to valid members for using the gym facilities. Further members photograph is displayed on the monitoring window when they access the door. COSEC application software is installed to perform the functions related to system admin like enrolling members, maintaining the member’s database, assigning time duration of membership and generating reports. All 2000 members can be configured under single door controller by utilizing COSEC PANEL LITE. Integration of their existing Tally software with Matrix COSEC system was also offered to Gold’s Gym. This helped them transfer their existing member’s database automatically to COSEC. An ISO 9001 Company, Matrix is a leader in Telecom and security solutions for modern businesses and enterprises. An innovative, technology driven and customer focused organization; the company is committed to keep pace with the revolutions in the telecom and security industries. With around 30% of its human resources dedicated to the development of new products, Matrix has launched cutting-edge telecom products like IP-PBX, Universal Gateways, VoIP Gateways and terminals, GSM Gateways, Access Control and time-Attendance Systems and Fire Alarm Systems. These solutions are feature-rich, reliable and conform to the international standards. Having global foot-prints in Asia, Europe, North America, south America and Africa through an extensive network of more than 500 channel partners, Matrix ensures that the products serve the needs of its customers faster and longer. Matrix has gained trust and admiration of more than 150,000 customers representing the entire spectrum of industries. Metrix has won many awards for its innovative Products.